Guess what we’re doing today! I used to hate road trips. But married life is pretty great in that it allows you to settle into your respective strengths and preferences. Nick does all the driving and actually insists that I keep myself occupied with my phone or laptop or book so I’m not tempted to nag him about his following distance or wince every time I think we’re about to die a fiery death on the interstate (which is often. I’m a nervous passenger). So he drives and I take advantage of the rare opportunity to spend the day immersed in daydreams and social media without an ounce of guilt. During this trip I’ve been dreaming of our next house. We plan to stay put for a few more years, but before Jack starts kindergarten we’d like to move back to the New Orleans Northshore suburbs to be closer to family and good public schools. We may build, we may buy, but either way it’s fun to fantasize about all the features I’d love to see included. A wraparound porch is definitely a must, as is a mudroom and a big yard for lots of plants and pets (in this daydream money also grows on trees). So anyway, I’m out for today. I hope you all had a fabulous weekend and, as always, thanks for reading! 5 responses to Road Trip! What a nice trip you are making. I too, let my husband do all of the driving and otherwise occupy myself. I used to do cross stitch when we traveled, especially if it was a well worn trip. Now, I find that I am Ms. Nosy Face. I want to see everything and not miss anything. I love to follow along with a map to visually mark how far we have gone. He is happy following GPS and see only as far as the next turn. We are leaving Friday for Prince Edward Island, Canada. It is a glorious road trip and a fairy tale destination. Sigh…. I could go on for hours. I hope you have a fun and safe trip. Oh, I’ve heard it’s beautiful there! Have fun! Have a safe trip! My strength is navigation and my husband’s is driving, so we make a good team! 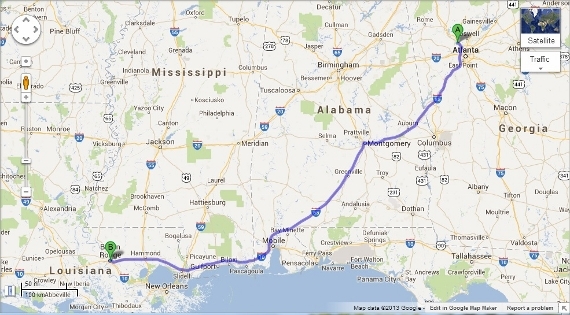 lol By the way, you are passing right by me today (Auburn)! How funny! We actually took a little detour through Auburn. I’ve been a few times because my friend Laura went to school there, but my sports-loving husband wanted to see Jordan-Hare and Toomer’s Corner with his own eyes. It’s such a charming town and campus! We stopped in Auburn as well when we went to Atlanta!